Obama File 75 American Rights at Work-Obama's Socialist Labor "Commissars". Control of organised labor is a key component of the Obama administration's power plan. "I do not view the labor movement as part of the problem. To me, it's part of the solution." 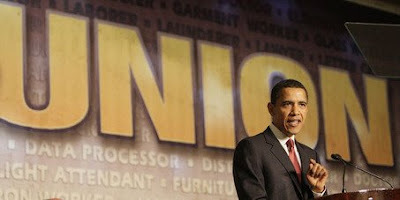 Obama wants to unify the labor movement under a centralised socialist leadership, answerable to him. This will provide President Obama and the Democrats with money and armies of loyal foot soldiers for their battles with the Republicans, "disloyal" Dems and non compliant businesses. It will also enable Obama to neutralise resistance to amnesty and citizenship for more than 10 million illegal workers curently in the US-which will almost certainly lock in millions of extra votes for Obama and the Democrats. One organisation, American Rights at Work (ARW) has served as a key transmission belt from Obama to the labor movement. It is now looking increasingly like becoming Obama's key control mechanism over the union movement. ARW has strong ties to Obama's old friends Democratic Socialists of America (DSA), the ultra left "think tank" Institute for Policy Studies (infamous in the 1970s and '80s for its reported links to Soviet and Cuban intelligence services)and surprisingly one of the US's largest mosques. Here's a "who's who" of key American Rights at Work personnel. David Bonior ARW President-A confirmed DSA member, Bonior was honored in December 2008 by Detroit DSA at its 10th annual Frederick Douglass-Eugene V. Debs Dinner. David Bonior served in Congress for 26 years rising through the leadership to become the Democratic Caucus Whip. During his tenure in Congress, Bonior fought to raise the minimum wage, protect pensions, support unions, and extend unemployment benefits. He led the fight to oppose NAFTA in 1993. He worked to prevent war in Central America in the 1980s and again to prevent the Iraq War in 2002. After leaving Congress, Bonior co-founded American Rights at Work, a labor advocacy and research organization, which has made passage of the Employee Free Choice Act its major legislative priority. Bonior was recently appointed to the Obama economic team. Bonior was touted as a likely Obama Labor Secretary but withdrew his name from contention. Obama then delegated Bonior to broker a re-unification of the US labor movement, bringing the Change To Win grouping and the AFL-CIO back together under one banner. The NYT’s David Greenhouse reported that, on January 7, the union presidents first met with Bonior, a member of Obama’s economic transition team...Bonior helped “arrange and oversee” the meeting. The union presidents issued their joint call after the transition team for President-elect Barack Obama signaled that it would prefer dealing with a united movement, rather than a fractured one that often had two competing voices. 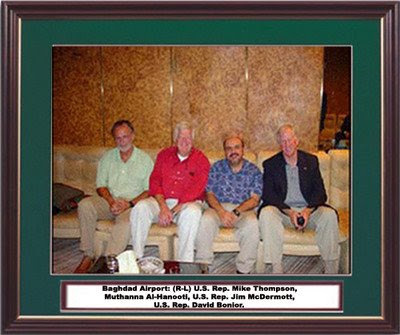 In 2002 Bonior and two other Democratic Congressmen Jim McDermott and Mike Thompson traveled to Iraq on a fact-finding mission. It was later revealed that Iraqi intelligence had funded the trip through a Michigan based Muslim group headed by Muthanna Al-Hanooti. Representative David E. Bonior (D-Michigan), House Democratic Whip, presented the 1997 Letelier-Moffitt Memorial Human Rights Domestic Award to Carlos and Alicia Marentes from Sin Fronteras, during a joyful and moving ceremony held at the historic Lincoln Theatre in Washington, D.C., on Saturday September 27, 1997... The Institute for Policy Studies (IPS}... organizes this event to honor the memory of Orlando Letelier and Ronni Karpen Moffitt, who where murdered in 1976 when a bomb exploded in their car near Sheridan Circle in Washington, D.C. Letelier, a former Chilean ambassador to the Unites States and Moffitt were at that time working in the IPS. Letelier reportedly was an agent of the Cuban intelligence service, the DGI. Hilda Solis-Until her appointment as Obama's Labor Secretary, Solis was a California Congresswoman and ARW Treasurer. Mary Beth Maxwell Also once tipped as a potential Obama Labor Secretary, Maxwell was ARW executive director until recently appointed as a senior adviser to Labor Secretary Hilda Solis. Prior to her 5 years at ARW Maxwell was National Field Director for Jobs with Justice an IPS partner organization known for employing DSA and Communist Party USA activists. 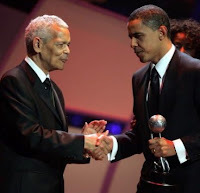 Julian Bond Serves on the ARW Board of Directors and was a longserving chairman of the NAACP and is a veteran of the Communist Party/Students for a Democratic Society organized Venceremos Brigades to Cuba. In the late 1970s Bond was vice president of the Democratic Socialist Organizing Committee-predecessor of DSA. Bond was honored at Chicago DSA's 1993 Debs Dinner. In November 2006, Bond returned to Cuba "to take a first-hand look at the island’s health system, and especially to find out about the Latin American Medical School (ELAM) and its nearly 90 US students." During the 1970s Bond was an occasional lecturer at IPS and a board member of the IPS spin-off Institute of Southern Studies. Carl Pope Serves on the ARW Board of Directors and is Executive director of the Sierra Club. In 1966 Pope was active in Students for a Democratic Society protests at Harvard University. Pope is a board member of the green/labor caolition, the Apollo Alliance with DSA member Gerry Hudson and IPS Trustee and former director Robert Borosage. Pope also works closely with another former Apollo Alliance board member, Van Jones. A "former" revolutionary communist, Jones now works with Hilda Solis as a "green jobs" advisor to president Obama. In September 2007 Pope addressed an IPS organized Teach In "Confronting the Global Triple Crisis at George Washington University. Wade Henderson Serves on the ARW Board of Directors and is president of the Leadership Conference on Civil Rights, a coalition of some 200 organizations. Henderson presented the IPS's 2007 Letelier-Moffitt human rights award to anti Iraq War group Appeal For Redress. 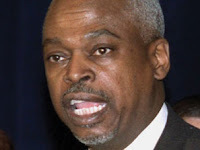 Wade Henderson, the president of the Leadership Conference on Civil Rights, described the domestic award winner Appeal for Redress as "a democratic movement within the military" calling for an immediate U.S. withdrawal from the war in Iraq. The organization is composed of more than 2,000 active duty service members, war veterans, and military families and "has rapidly become the most influential force within the U.S. armed services to challenge the U.S. occupation of Iraq," according to IPS. Harley Shaiken Serves on the ARW Board of Directors and is director of the Center for Latin American Studies at the university of California, Berkeley. Shaiken is a leading anti globalisation activist and advocate for relaxing US sanctions against Cuba. Shaiken has worked closely on "disarmament, economic conversion and economic democracy" with IPS founder Marcus Raskin and IPS scholar and DSA member Noam Chomsky. Seventy people attended the eighth annual Frederick Douglass-Eugene V. Debs Dinner held at UAW Local 600 in Dearborn on Saturday, November 18th. (2006)The dinner is the major fundraising event each year for Detroit DSA...The keynote speaker was globalization expert Harley Shaiken who gave a chilling description of the consequences of corporate globalization as well as some suggestions as to how progressive activists can fight this phenomenon. Shaiken was also widely touted as a potential Obama Labor Secretary. Imam Sayed Hassan Al Qazwini Serves on the ARW Board of Directors and leader of the Dearborn Michigan (David Bonior's old congressional district) based Islamic Center of America (ICOA) and founder of the Young Muslim association. Born in Karbala, Iraq Qazwini's family moved to Iran after the 1979 Islamic Revolution. After a religious education in Iran, Qazwini followed his family to the US in 1992. According to political journalist Debbie Schlussel, Qazwini professes to oppose al Qaeda but nonetheless: (a) maintains a close affiliation with the Iranian government of Mahmoud Ahmadinejad; (b) is friendly with Hezbollah spiritual leader Sheikh Mohammed Hussein Fadlallah, who issued the 1983 fatwa that resulted in the bombing of the U.S. Marine barracks in Beirut which killed 241 American servicemen; and (c) openly supports both Hamas and Hezbollah. 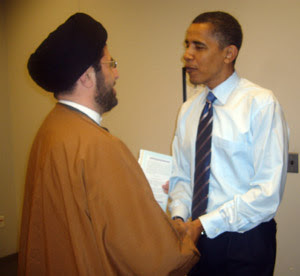 Qazwini met with then presidential candidate Barack Obama in May 2008. Imam Hassan Qazwini, head of the Islamic Center of America, said in an email that he met with Obama at Macomb Community College. A mosque spokesman, Eide Alawan, confirmed that the meeting took place. During the meeting, the two discussed the Presidential election, the Arab-Israeli conflict, and the Iraq war, according to Qazwini. At the end of the meeting, Qazwini said he gave Obama a copy of new book, "American Crescent," and invited Obama to visit his center. The meeting with Obama came about after Qazwini had asked David Bonior, the former U.S. Rep. from Michigan, if he could meet with Obama during his visit. Qazwini was not selected to be part of a group of 20 people who met with Obama, but Qazwini later got a private meeting with Obama, Alawan said. "They gave him an opportunity for a one-on-one," Alawan said. . . .
John Sweeney Serves on the ARW Board of Directors and is president of the US's largest labor federation the AFL-CIO. 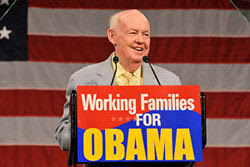 Sweeney joined DSA around 1995 shortly before becoming AFL-CIO president. Sweeney soon reversed the ban on Communist Party members holding office in AFL-CIO affiliated unions. Sweeney now heads a federation almost totally dominated by communists, socialists and former "new lefters". Sweeney is also a member of the powerful Trilateral Commission and enjoys close ties to IPS, even honoring Brazil's Marxist president "Lula" on their behalf. There are several clear threads running throug American Rights at Work-pro Cuba, anti-Iraq War, pro DSA, pro IPS. Most AWR officials would struggle to get a security clearance to clean latrines at any US military base. Yet three AWR alumni-Bonior, Solis and Maxwell now work closely with president obama at the heart of the US government. No less than four ARW board members were touted for the Labor Secretary job. Talk about socialist nepotism-did anyone else have any chance at all? Several ARW figures are close to DSA, IPS or both. DSA and IPS both have close ties to the Communist Party USA and the equally militant Committees of Correspondence for Democracy and Socialism. All four organisations have had members or associates convicted or accused of spying for foreign governments. All are militantly anti-American and openly or covertly pro Marxist socialism. ARW is perfectly positioned to build a socialist led, Obama friendly labor movement. But will Obama's Labor "Commissars" be tough enough to keep America's unruly "proletariat" in their place? Trevor. You used to post lots of funny stuff about NZ commies, socialists, anarchists, lefties and pinkos. Now you just post boring articles about Obama. I do have some plans to correct the situation. Stay tuned. Keep up the Good Work Trevor! Incredible work ferreting out the Left tendency of the American political landscape. Your observations are an important document on the deteriorating conditions in my country. All those who fear Socialism is on the march again in our hemisphere should study Trevor's blog religiously. Our marxist president is trying to weld a Third Way coalition of radical activists and theorists among the intelligentsia into a stealth vanguard that will attempt to normalize what were formerly unheard of viewpoints. The Progressive ideology is marching again, and with it, the power of the State. Thanks Highball-well said. You've obviously been researching this issue for some time.